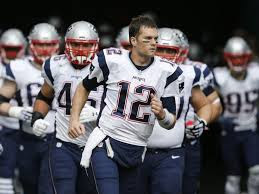 Tom Brady (pictured in the center; he's Number 12) is the Quarterback of the New England Patriots professional football team. That's the outfit that won the Super Bowl last Sunday. It was a fifth Super Bowl victory for Brady. I don't follow sports much, but even I recognized Brady's name, when I saw a headline in the February 1, 2017 edition of The Wall Street Journal. The article was titled, "Meet Tom Brady's Shaman." The "Shaman" in question is Don Miguel Ruiz, author of The Four Agreements: A Practical Guide To Personal Freedom. According to the column, Brady "takes everything" from this book. "There isn't a wrong word in that book," according to Tom Brady. This all seems like good advice to me (even though I haven't read the book itself). I couldn't help but think, though, that Tom Brady could do everyone a big favor by sending a copy of the book, with Brady's recommendation, to our recently-elected President. "Hey, Mr. President," I can see Tom Brady saying: "Check out Agreement #2." The headline on the article from which I snagged the picture at the top of this blog posting says this: "Tom Brady refuses to discuss Donald Trump: ‘Let’s talk about football stuff.’" That's an admirable sentiment, and probably wise, but Tom, your country needs you now. If President Trump doesn't get the message on Agreement #2 (and let's throw in Agreement #1, as well; that seems applicable), we are in for some very bad times!